What will Cascade Lake-X be capable of? In 2017, Intel reacted to the threat of Threadripper by pumping out high core count (HCC) Skylake-X processors in the consumer space. And, while processors like the Core i9-7980XE outperformed the highest-end Ryzen Threadripper 1950X, they were also much more expensive, leading more enthusiast consumers to go with AMD’s high-end desktop (HEDT) solution. We expected Intel to follow Skylake-X with Cascade Lake-X, but we got Basin Falls Refresh instead. However, there have been some leaks that point to Cascade Lake-X being the next HEDT release – though still stuck on 14nm. We’ve already seen some Cascade Lake processors show up in the small business-focused Intel Core Xeon E processors, so we can’t wait to see what Cascade Lake-X becomes. Just because Cascade Lake is focusing on server chips right now, doesn’t mean that there isn't any excitement to be had, or that it won’t turn into HEDT products later on down the line. So, keep this page bookmarked, as we’ll update it with all the latest information. Even though we’ve finally got word from Intel about Cascade Lake server processors, the release schedule for Cascade Lake-X is kind of a mess. Some Cascade Lake Xeon processors hit the street already, namely the Xeon E-2100 line processors. These chips are aimed at small businesses, with up to 6 cores. 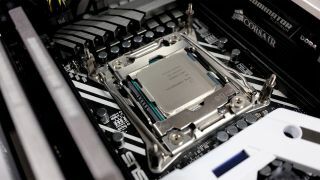 There are also some 48-core server grade Cascade Lake processors coming out later this year, according to a report from Ars Technica. We’ve also seen a leak from the Chiphell forums that hints at a Cascade Lake-X reveal at Computex 2019. This leak refers to these new chips as LGA 2066 parts, which would put them in the same league as Intel’s new Basin Falls Refresh processors. That’s all we know for now, but something tells us that there will be much more to Cascade Lake over the next few months, so stay tuned for all your Cascade Lake release date information. This is where things might get uncomfortable, so brace yourself. Intel doesn’t exactly have a history of releasing HCC and HEDT processors for what we would call ‘reasonable’ prices. So, we expect the pricing of Cascade Lake-X to fall in line with, or exceed Skylake-X’s pricing. When it comes to the eventual Cascade Lake-X chips, and the Xeon W chip the prices are going to be much higher. So, we’ve taken the liberty of listing the pricing of Skylake-X processors below. Assuming for a second that the 28-core CPU showed off at Computex is indicative of what we can expect from Cascade Lake-X, things are about to get bananas. Skylake-X offered significantly higher core counts than the previous generation of HEDT processors because it was manufactured on a smaller die. Cascade Lake-X doesn't have the same advantage as it’s still based on 14nm++ manufacturing. So while it will be able to offer slightly higher core counts, core clocks and power efficiency than Skylake-X, the leap in performance isn’t going to be as breathtaking. Still, Intel could use this process refinement to deliver a better value proposition – maybe offering a 10-core CPU for under $1,000. This could attract plenty of enthusiasts over to this server and enterprise platform, rather than more affordable mainstream CPUs. That’s all we know for now, so now we just have to wait for Intel to reveal what’s in store – and we’ll be sure to update this page the second we know more. Who wins the processor war between Intel vs AMD?